I'm running out of new wax to review! I'm scrapping the bottom of the barrel to find stuff to review lately. I'm somewhat in a bind too since I have a trip coming up and I'm trying to save money. I don't imagine I'll be buying new wax soon since there is nothing new in stores and vendor wax is more expensive. That being said, I did find some stuff to melt this week to share with you. My Thoughts: I'm always hesitant with Christmas tree scents. I used to love them, but lately, I find them to be so heady and overwhelming. This one is actually nice. It really is a perfect blend of Christmas-tree notes and crisp winter air. Of all of the Christmas tree types spruce is my favorite. It's the brightest of all of those tree types. This scent is bright, fresh, and woodsy. I'm a fan. My Thoughts: I've had this one sitting in a drawer for awhile because I was scared of it. I love Herbal Essences shampoo smell, but this wax on cold sniff was so strong I was afraid it would be too much when melted. I'm happy to report this wasn't the case. The scent dispersed nicely in in the room and wasn't overpowering in the least. This is a very clean scent that leaves just the right of amount of freshness in the air. My Thoughts: This is your quintessential fall scent. This is a nice blend trio of pumpkin, apple, and cinnamon. This scent doesn't go sugary sweet or into synthetic territory. It's a very natural scent that is very warm and rich. I was in the mood for it the other day, but quickly realized I prefer something a little brighter and fresher this time of year. That said, it does not diminish the quality of this scent, it's awesome! I'll just wait until September. Scent Description: A tropical twist of ripe island mango nectar with sweet mandarin oranges, ruby red grapefruit and exotic dew fruit. So tempting, you can almost feel the madness! My Thoughts: I knew on first sniff this would be a problem, but I put it in the melter anyways hoping for a different outcome. 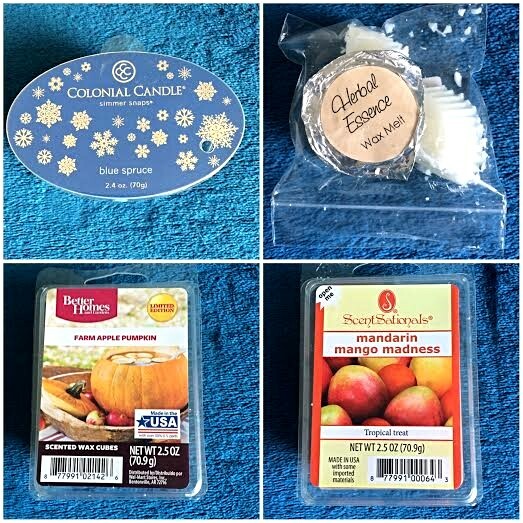 Mango scents (as well as peach) I've noticed are really hard to replicate in wax naturally. They tend to go musty. Instead of smelling like fresh fruit they smell like overripe moldy fruit. This was the case with Mandarin Mango Madness. Not nice. I quickly tossed this one out of the warmer.